There's a bit of a story behind my entering this race. About two weeks after surviving Run With Scissors, my first marathon, I made a trip to the shoe store to replace the trail shoes I had worn and destroyed in that race. While at the shoe store I ran into American 24 hour record holder, Connie Gardner. I mentioned that was replacing the shoes I destroyed at Run with Scissors and she said she had also run it and that it was one of the most brutal race experiences of her life. Then she said something I was not expecting. "The Medina County Road Runners are putting on a 50K the 25th. You should come run it. If you finished Run With Scissors you be able to finish this. You might even have a faster time." I said I would consider it but had already dismissed it in my mind. An ultra less than a month after my first marathon? That's crazy talk! But with the encouragement of Chanda and a close family friend I had soon decided that, while a little crazy, it was achievable. So, with only one 18 miler under my belt since the marathon I began to taper again. Learning from the marathon I decided to go out and invest in a hat. While at the running store I looked at some real cold weather running gear but decided that it simply was not within my miniscule running budget. I checked the weather. 45 degrees and mostly sunny. Only a 10% chance of rain. At the very least I would be dry! "Runners will traverse a 5-mile circuit around lakes and through woods six times, followed by a 1-mile loop to make 31 miles. The route is 95% dirt trails, and it's flat as a pancake." The morning of the race it was 28 degrees and snowing. Not a glimmer of sunshine to be found. I put on my KinvaraTR's but decided to take my Kinvara2's in case the trail consisted of hard packed dirt road rather than the soft cushy dirt of a technical trail. I gathered with the other runners, about 60 of them, and listened to the final pre-race instructions. "We will be running the mile loop first rather than last. We're going to follow that sidewalk right there..."
"Good" I thought, "We'll get the pavement out of the way first. Then it's all trails!" Boy was I wrong! We ran the mile loop and then headed into the woods. The whole first mile of the 5-mile loop was paved. The next mile vacillated between patches of clean pavement, gravel covered pavement and crushed lime road. When we finally rounded a corner and dropped down into the woods my watch read 3.1 miles. The dirt trail was about 2.5 miles and then there was about a half mile of pavement taking you back to the beginning of the loop where you were required to check in before heading out on the next loop. I decided that I would try to tough it out in my trail shoes through my third lap and then switch to my road shoes for the final three loops. The first three loops I held a pace of slightly under 10 minute miles. I felt great! I could tell that being under dressed was taking a toll, causing me to expend more energy than normal but I wasn't worried. At the end of the third loop I stopped to change my shoes, told Rebecca who was crewing for me to be ready to pace me the next loop and headed back out. About 2 miles into my fourth loop I began to fall apart. My hips were beginning to ache from the pounding of so much pavement. My legs suddenly felt heavy and stiff and I was beginning to become board with the course. I started making deals with myself, "Run the next half mile and then you can walk again". 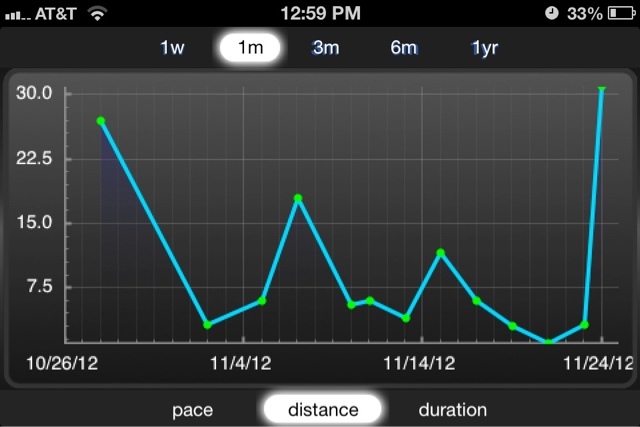 I watched the average time gradually fall from a 9:55 pace to a 10:20 pace. I turned off the watch. I finished my fourth loop, checked in, filled my water bottle for the first time and headed back out with Rebecca. Rebecca was great! She encouraged me to correct my form and pushed me to keep moving. About a half mile out I realized that I should have used the restroom before we headed out. No big deal. There was a trail head with a toilette at mile 1.5. When we got to the trail head we made the slight detour to use the restroom. My urine was dark. Almost brown. Not good. It was at that point that it hit me. I had only filled my water bottle once. What was I thinking!?! I should have been monitoring my hydration more carefully! I knew better than to only drink 20oz over the course of 21 miles. Things had been going so well and I never felt thirsty so I just let it slide. What a huge mistake! I left the toilette and reported to Rebecca that I was dehydrated. She decided that it was best to take it easy this time around and focus on getting rehydrated. We walked as much as we ran that fifth loop. Talking, laughing, and making sure I got down every drop of the 22oz my water bottle held. 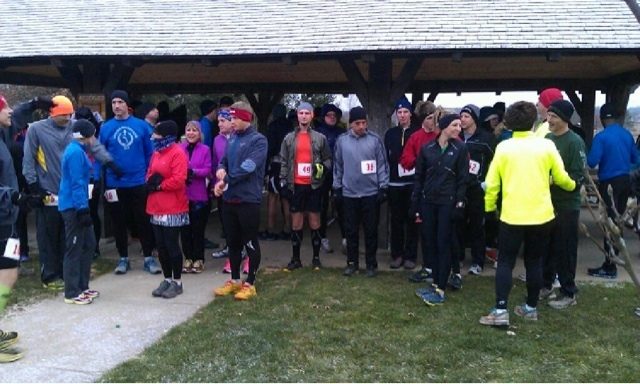 We came back in to the aid station having completed the loop in about 1:14. When I checked in I asked if I was the last one. "Yes" was the timekeeper's response. "About half quite early but you are the last one going back out." I filled my water bottle again and started to run. I decided that I would try to make up some time but after running about a mile had given up on the idea and started walking again. Then I crossed paths with another runner, the race director for Run With Scissors. "What are you doing walking?" He said. "At this point it hurts no matter what you do. Might as well run!" "You know what?" I thought. "He's right!" And I began to run again. And I ran hard! As fast as my legs would carry me, I ran. (Which wasn't really that fast) I decided that I was going to run back "fast" or get injured trying! About mile 29 I passed another runner. I wasn't last anymore! This also prompted me to keep running. I knew that at this point in the race, if I were him, I would be trying to regain my position of not last place. And so now I was also running away from him. I finished my final loop in about 45 minutes. The fastest loop of the race. My time was 5:49, 7 minutes faster than my marathon. I had done it. 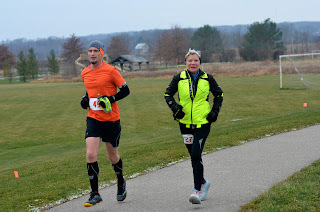 In a race where over half the runners had quit early I persevered. I overcame some pretty big physical and mental obstacles. I became an Ultramarathoner! Runners should wear as little shoe as their biomechanics will allow for the distance and type of terrain they are running. What does that mean? Basically this; when you are out on a run you should be relatively unaware of your shoes because you have found the right balance of weight, support and cushioning. Too little shoe may not offer enough support, cushioning or protection while too much shoe could feel heavy, clunky or unstable. That being said, my review is written through the filter of that perspective. I see no need to give the specs for the shoe as you can easily find everything you need to know at Saucony's website. Instead, I will focus on my initial impressions of fit, comfort and ride on various terrains. I hope you find my perspective helpful. They are lightweight and low to the ground. They do not feel nearly as cushioned as the street version of the Kinvara however, the rock plate is surprisingly flexible. The upper locks your foot in well! I found it to be soft and snug but not overly tight. My overall impression was that these shoes would be a good fit for me but I was a little concerned that they may not offer enough protection from rocks and roots on the trails. I chose a route for my first run that would offer pretty varied terrain. It started with about 4 miles of technical trail, followed by a half mile of pavement and rounded out with a mile on a crushed limestone jogging path. Technical Trail - This section of the route consisted of soft dirt, covered in leaves, with plenty of roots & rocks and a lot of elevation change. These shoes gave me exactly what I want out of a trail shoe! They all but disappeared! They are so light that you barely feel them on your feet. The low sleek design allowed me to feel excessively sure footed even though many of the rocks and roots were covered with leaves and could not be seen. The rock plate provided enough protection that I never worried about bruising or injury but still allowed me to feel the nuances of the trail. The tread design grabbed well on the ascents and descents and provided descent traction in the mud. I was pleased to realize that the design also quickly sheds the mud once you are back on dry ground. Altogether, I couldn't have been happier with my first experience running technical trails in them. As with many trail shoes, the ride on pavement is less than desirable. The stiff tread leaves the shoe feeling very firm and a little unforgiving. Running half a mile wasn't bad however these are not a road to trail shoe. They are perfectly adequate for crossing the street or taking a short jog down the road to the next trail head but they would probably not be my first choice for a route that had a high percentage or long stretches of pavement. On the crushed limestone I felt like I was wearing racing flats. The low profile and firm ride felt good for the mile I was on the path. These shoes might be a great alternative to a road shoe on this surface when the weather turns cold and the ice and snow create a need for better traction. Until that time, I'll stick with the road Kinvara's as my first choice for those runs. At this point I absolutely love this shoe! They have the low, fast feel I was looking for in a trail shoe. That being said, I have only run 5.5 miles in them! I have no idea how durable these shoes will be nor whether or not they will provide enough cushioning and support for a 16, 18, or 20 mile run. I will continue to use the KinvaraTR's as my primary trail shoe and report back to you in a month or two! Until then, train hard, eat right and live life to the fullest! After only 205 miles the upper began to disintegrate. I am rather disappointed with the lack of durability I experienced & am unlikely to purchase another pair until I see an update advertising a more durable upper.